It seems a bit of a shame that my post on dinner at the Slanted Door in San Francisco’s Ferry Building only consists of a single drink shot. But my camera wasn’t really feeling the lightening situation during our fantastic meal that started with oysters and Niman Ranch pork spareribs with honey-hoisin sauce, moved onto a fresh and tangy grapefruit and jicama salad with pickled carrots and candied pecans, Niman Ranch shaking beef with an addictive lime dipping sauce and steamed whole striped bass with ginger scallions and soy, and ended with pumpkin sorbet with hazelnut and crème fraîche and a coconut water tapioca with persimmon and coconut sorbet. But it was a Pisco Sour that kicked it all off. Up until the first frothy sip, I thought Chicago’s Violet Hour had the best Pisco I’d ever tried, and my dining companion swore by the one she had in Peru (where the drink allegedly originated). But after trying the Slanted Door version made with Marian Farms organic California pisco, biodynamic lime, organic egg white and Angostura bitters, we both decided it was the best version we’d ever sipped. 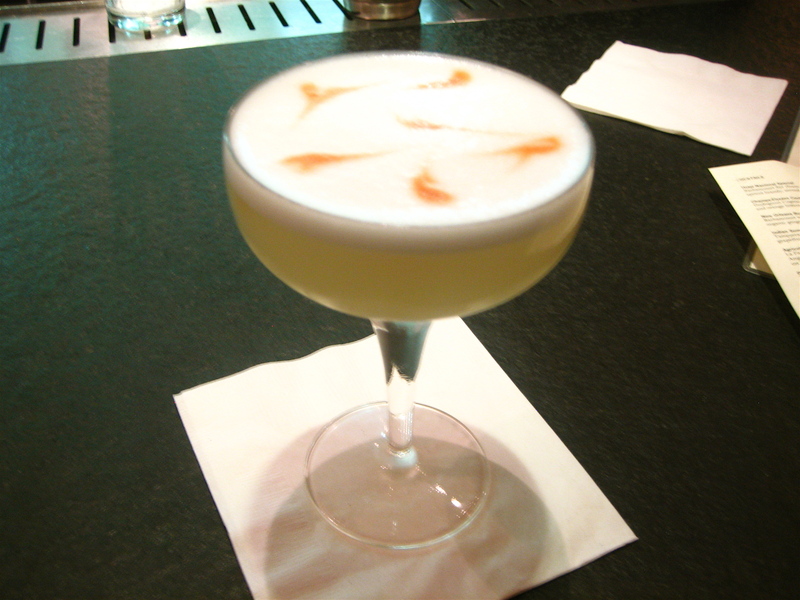 A cross between an amaretto sour and a Tom Collins, to me the Pisco is the perfect combo of savory, sweet and lime, frothed with egg whites and dotted with the pungent Angostura bitters that resemble gold fish swimming on top. Are you certain that you didn’t just drink Pisco Sour after Pisco Sour and forget to eat and then jot down a few notes about the menu after looking at it online. I’m not saying that’s what you did in San Fran but the people at The Violet Hour talk and I’m just saying….